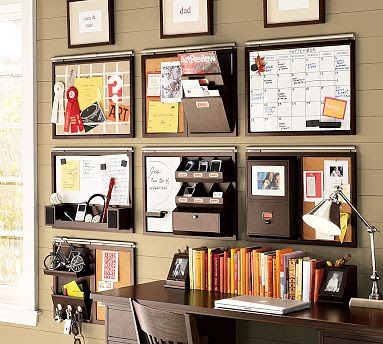 Get inspired and excited about organizing through these pictures below. After all, a picture IS worth a thousand words! I love decorating, but more than pretty decor, I couldn't survive in a home that was disorganized. 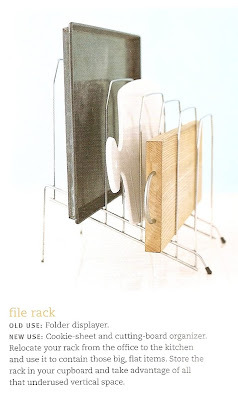 I am constantly on the hunt for new storage bins, totes, baskets and fun gadgets that solve more than one problem so I'll have less STUFF in our home. 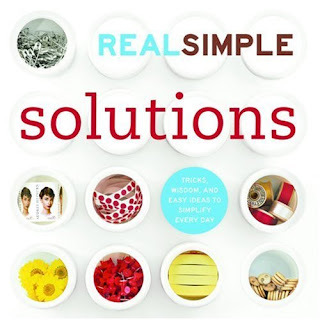 One of my favorite books is REAL SIMPLE solutions. If you are a fan of the magazine, you will LOVE this book! 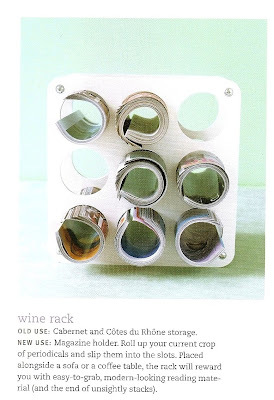 It not only shares the most creative ideas and tips for each area in your home, it also allows you to reuse and re-purpose what you already have in multiple ways so you can save money too! 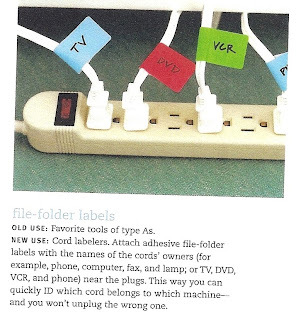 The first three photos below are straight out of the book and show some great ways that you can organize your stuff by turning old items into new storage solutions. This next group of photos shows how you can add more storage to your current space to not only create the look you want but also add more function to each rom. 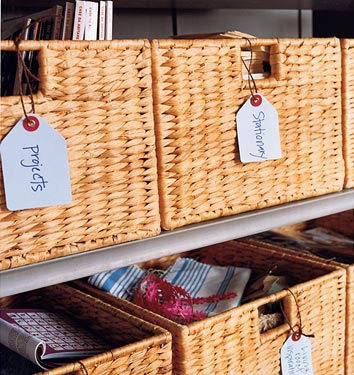 Storage baskets, bins and totes instantly make a space feel more organized and give items a permanent and defined home. Magazine holders are great. I have a pretty set on my desk in pale pink and another set in my office closet. 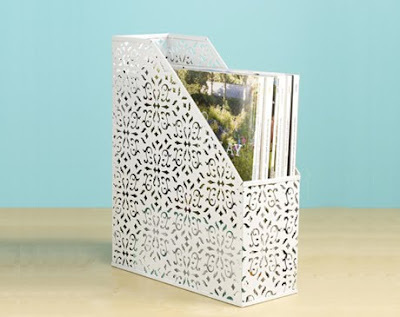 They are the perfect solution for those that want to keep back copies of magazines or file away new ones that have not yet been read and they can add an elegant touch to any home office. Quick tip: Another options is to tear out the pages you like and file them in clear plastic pages in a binder vs. keeping dozens of dust-collecting publications. 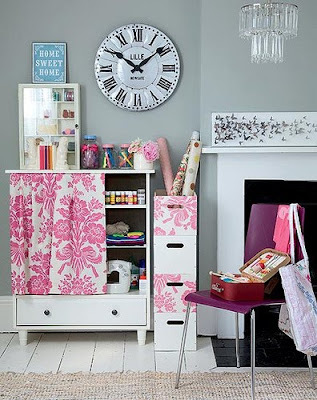 Furniture with storage comes in many shapes and sizes. Whether it be a storage bench in your mudroom, entryway, a storage ottoman for your living room or a banquette for your kitchen area, storage with furniture is where it's at! We must make the most of each room and each space and this is a great way to accomplish that. 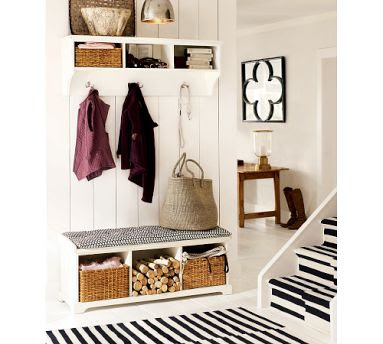 When the storage spaces are open, use pretty, matching baskets to create a uniform look. Sometimes, after you've tried everything else, you'll realize that a cabinet is in order to keep things neat. Your local home improvement store or any discount retailer will sell easy-to-install and relatively inexpensive cabinets which can be used in laundry rooms, craft rooms, home offices, garages and closets. For a more polished look, you could opt for a custom built in cabinet as shown above. 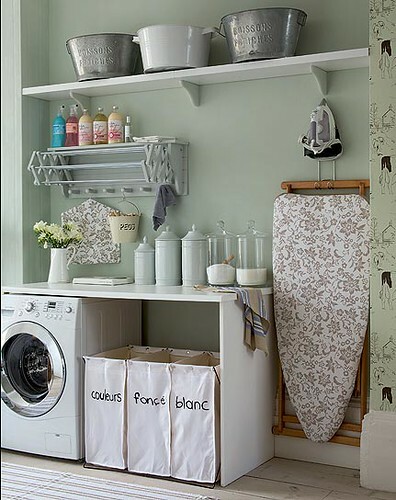 I am loving this laundry room! Potterybarn does a great job of creating elegant looking systems for every room in the home. Grouping smaller like items together is the key to organizing success and visual beauty. 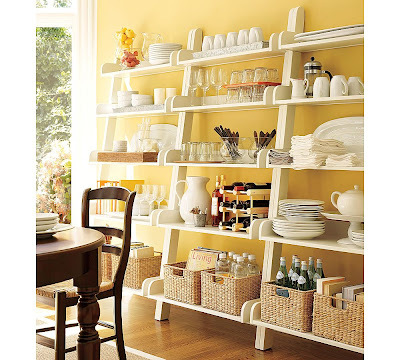 Small collections are best displayed on a shelf, in one particular area or on a single wall. These photos are proof that not all beautiful spaces need to have everything tucked away and out of sight. You could also easy transform your craft area into a pretty space by using some bright, punchy fabrics with hints of elegance and sophistication. You can also take regular cardboard boxes and wrap them in delicious patterned paper or fabric remnants to give them new life. A fresh coat of white or colorful paint can instantly transform an old or salvaged dresser into something beautiful. If you are committed to becoming more organized this year, there is a challenge running for the month of February on the Organizing Junkie blog. Laura's blog button is also in my left sidebar. She's got a fun challenge for full rooms and small spaces with prizes to boot for several lucky winners! So, what are you waiting for? Will YOU be joining me in organizing for a fresh space this month? My laundry room/storage space is next on my list. Here's to a clutter-free and organized home! Hi Karla! A lot of great inspiration and information for organizing here. Thank you. Thanks so much for entering the giveaway and tweeting about it too! Best of luck. Hope you're having a good week. 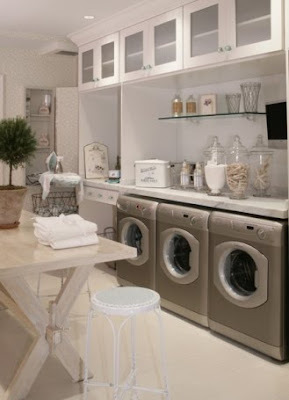 I love the first photo... my laundry room is next on my list... thanks for the inspiration! I've been trying to get some great ideas for how to reorganize my back porch.